Do you have family and friends visiting you this Holiday Season? With the crush of travelers around this time of year, flight plans often get delayed or even canceled due to a number of issues. The ability to follow your family’s flight in real time, without the hassle of an airline 800 phone automated prompting system, can be a relief. One of the greatest tools to follow your friends and family’s airline travel progress is the Flight Tracker by myrateplan.com. This is a quick tool that tracks flights in real time providing a map of the plane’s location, departure times, any delay information, and estimiated time of arrival. Time management around the holidays can be a challenge. With the Flight Tracking system, you can check one more task off your list. 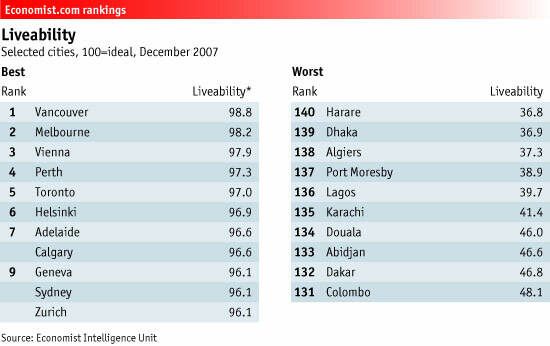 The well respected, if not sometimes controversial, economist.com came out with their Liveability rankings or what they describe as ” world’s most liveable city.” The findings provided by the “Economists Intelligence unit” rank 140 cities worldwide. The winner and #1 most liveable city in the world this year is Vancouver, British Columbia. Not one American city appeared in the top ten cities. It is interesting to note that three Canadian cities, Vancouver-Toronto-Calgary, were all ranked in the top 10 most liveable cities in the world.